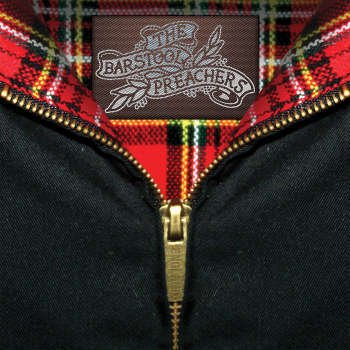 “Never look down on anyone, unless you’re giving ‘em a hand up.” ~The Barstool Preachers. This lyric sets the tone for the debut EP from UK ska punk band The Barstool Preachers. I’ve been listening to the three track EP for a couple weekends now and the more I listen, the more I get drawn into the upbeat hook heavy sound. If I may make an attempt to describe the sound, (you know I’m going to) I’d say we’ve got about a 60/40 blend with the high side leaning towards the ska end of the ska-punk spectrum. I hear influences of Madness, Specials, NOFX, Dropkick Murphys, Goldfinger, and “Stay Tuned” era Let’s Go Bowling. Of course these other bands may or not be influential in the least for this band, but artifacts or their sounds can be gleaned if you listen in. All of my perceived references aside, despite lyrics that are tinged with a bit of drunken regret, I get a solid sense of positivity out of this band’s sound. They don’t come across as pissed or whiney, but friendly and real. Sure, I like ska punk and this is 100% up my alley, but the songs tell a story and the sound puts me in a happy mood. The only drawback is that you only get four-ish minutes of this gem. What you get at the end is a one fine EP from what seems to be a promising beginning to an new ska punk band. Three cheers for The Barstool Preachers.